hi tuan Danny & good evening to all m’sians..
i’m a newbie here & quite old too.. suprise with the technology these days.. boleh sembang2 with so many people, young & old..
they are getting better in matching the genuine products each day, and even worst, those guys are bold & daring enough selling them online as genuine products..
sometimes i become sakit hati when my friends got conned buying fake goods with their hard earn money.. what can we do? 1) The old adage is buy the seller, not the watch. 2) When in doubt, send for SC verification. 3) Unless we are talking about vintage pieces, we should be getting full boxed sets. Most of those replica adverts would have "watch only, no box or papers" and with unreasonably low prices. So most of those whom buy into the replicas knew what they were buying into really. Thank you for the tips..
Just sharing my experience assisting a friend in his mishap.. The advertiser even promised him should the product is fake, refund is guaranteed. Then it becomes i say, u say.. nothing much can be done.. 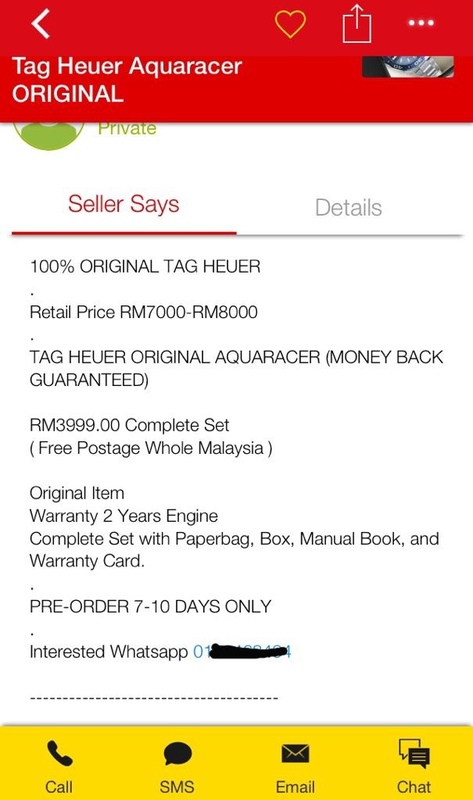 The only thing is that these adverts keep on appearing in the online sales apps, some do tell, with much cheaper price circa hundreds, but there might be a next person to face the same fate as my friend had experienced.. Being not a watch expert, I may find it difficult to look at all the watches for sale in Mudah. 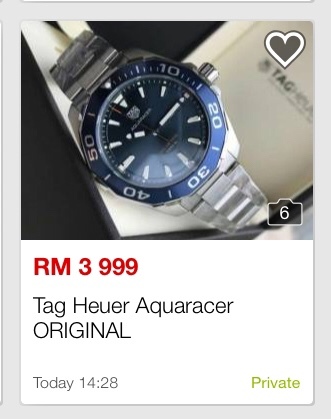 This also appears similar in Carousell, looking at Rolex watches at very cheap prices (only at RM100+) - to me, I think it is obvious those are fake watches. Well, to buy watches in online sites, and to get them confirmed as genuine, verification is needed. Otherwise, one may be buying fake ones at whatever price stated. Yes, nowadays, technology today has improved a lot. Current ad in mxxxx.com, what do you think? It has been happening for quite some time. Especially when online marketing becoming popular. A lot of people can get these counterfeit items easily via online. There's nothing much we can do if being conned but can try to make a report to that particular brand / company authority. never think of that.. probably i’ll suggest my friend to do so.. I suppose to add on, "if it seems too good to be true, it probably is"
Personally saw the advert and was tempted myself to try!